I'm trying to open the keyboard settings from the System Settings app, and the app just closes down. Every other item opens just fine. Please let me know what other info I can provide. I don't know what details will be helpful in troubleshooting. Have you installed elementary-tweaks per chance? (I see Tweaks.vala in your terminal output) Unfortunately while a great application, it is reported to cause issues and is not recommend. This might be one of those issues? Try uninstalling it and see if the problem persists. If that fixes it I'd suggest posting a bug to the elementary-tweaks bug tracker. Just for clarification, gnome-control-center is a bash script that redirects to switchboard, which is the actual name of the System Settings app in elementary OS. Upon further inspection of your terminal output, it shows a segfault on line 20, which is where the redirection takes place. 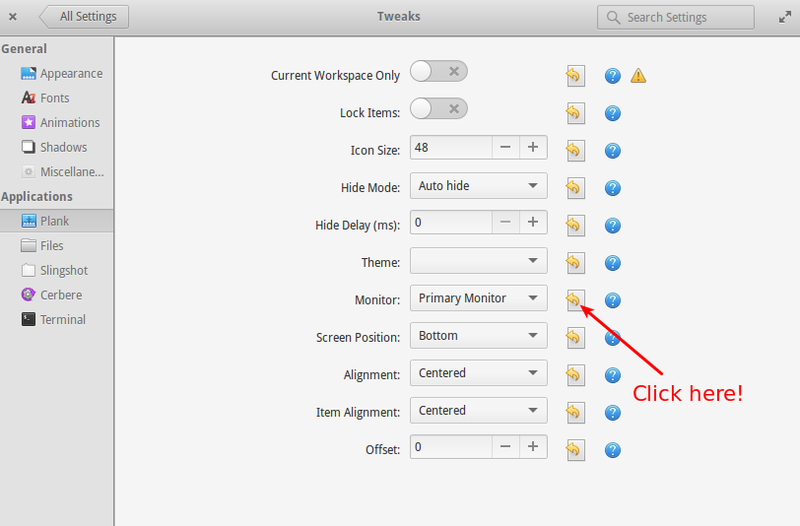 The actual command to open the keyboard settings dialog is switchboard keyboard. Run that command directly and see if it gives any additional clues. If there is nothing obvious there, run it with the -d flag to show additional debug information. switchboard -d keyboard. If a reinstall doesn't help, it is time to hit the switchboard-plug-keyboard bug tracker. See this answer for best practices in lodging bug reports. I notice there are several existing bugs related to crashing on there already that may be possible duplicates of yours. Please update your question with the -d output and a link to the bug report. Also consider including a link to this question in your bug report in case someone else comes along and solves your problem here. 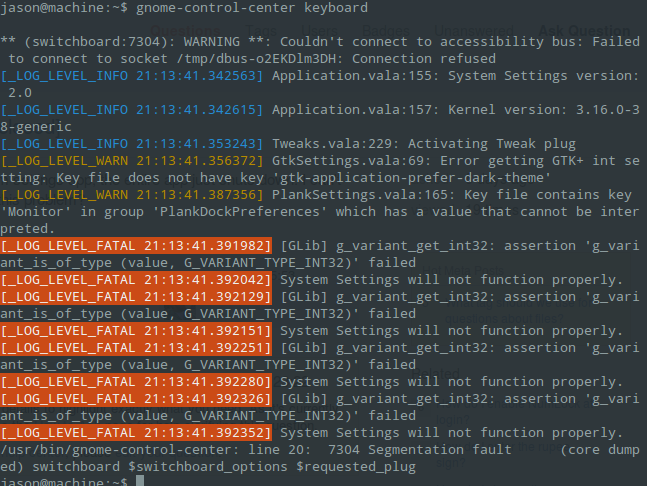 Notice the key file contains key "Monitor" in group "PlankDockPreferences" in your terminal output? I'm not sure, but I am guessing it's because I sometimes plug in a 2nd monitor and I shift the displays around and Tweaks is trying to save it. After I unplug the monitor the configurations causes an error and quits. Fresh install - Linux newbie - when i try to open displays in system settings it just closes? How can I access hidden plank settings? How to customise terminal to condense my the path to show just the current folder?